Let’s talk about how to put these oils to use DAILY! We have certain blends that us mamas have grown to love! 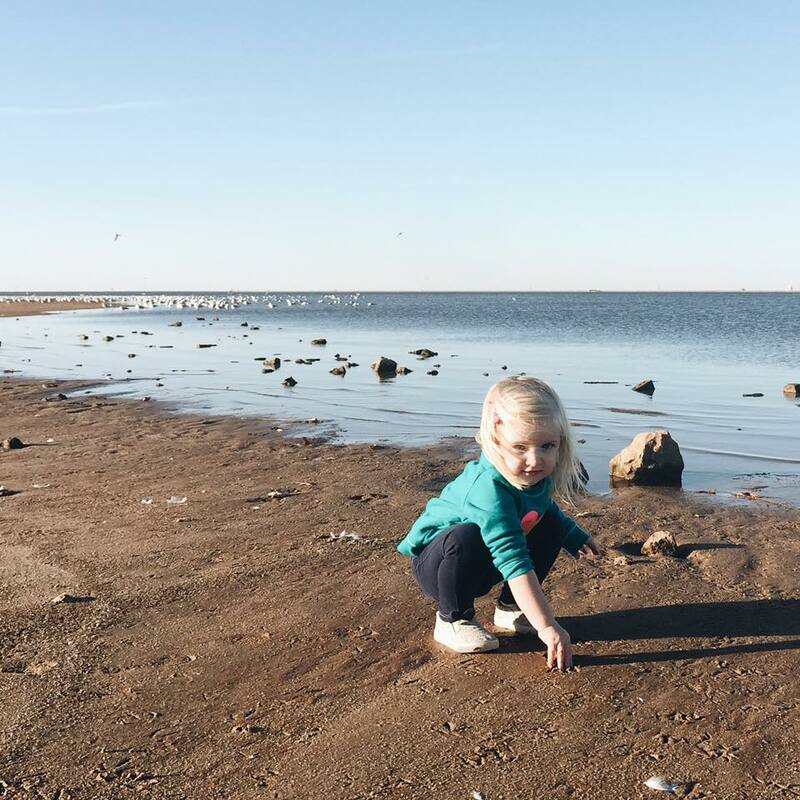 We all want to be proactive with our kiddos so that we can stay ahead of the winter germs! This blend is great to have in our tool kit and use AHEAD of time! +Thieves — Mom’s best friend. 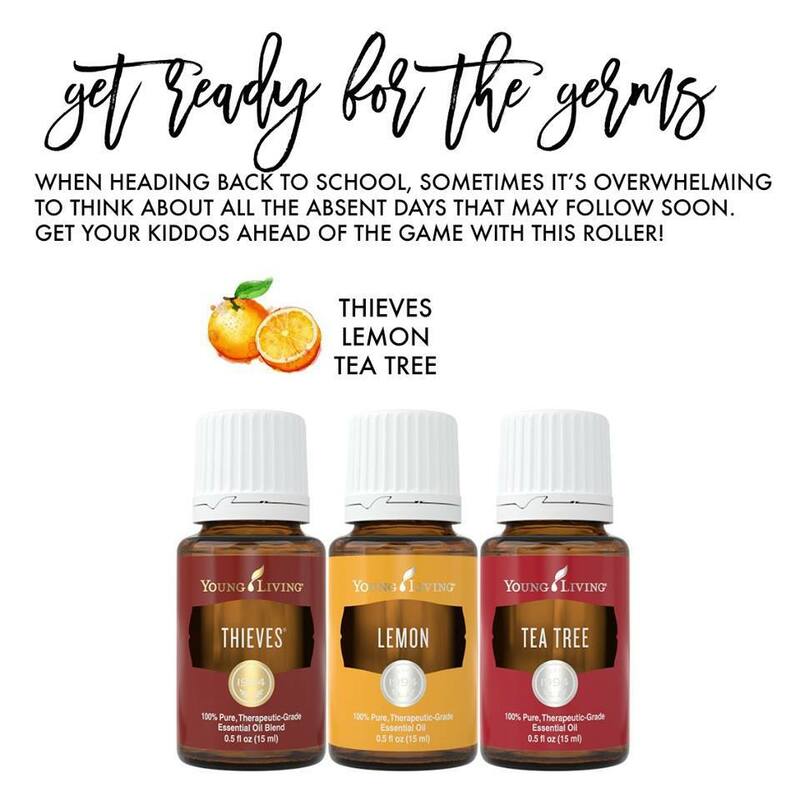 Thieves is a blend of essential oils specifically designed to support the body’s immune system health. +Lemon — Lemon is used worldwide in cleaners and soaps for its refreshing scent and cleansing properties. +Tea Tree — Tea tree has a strong herbaceous and woody scent. It’s great for cleansing and is often added to skin care products. Let’s talk about how to put these oils to use DAILY! We have certain blends that us mamas have grown to love! First up is the Butterfly Blend! 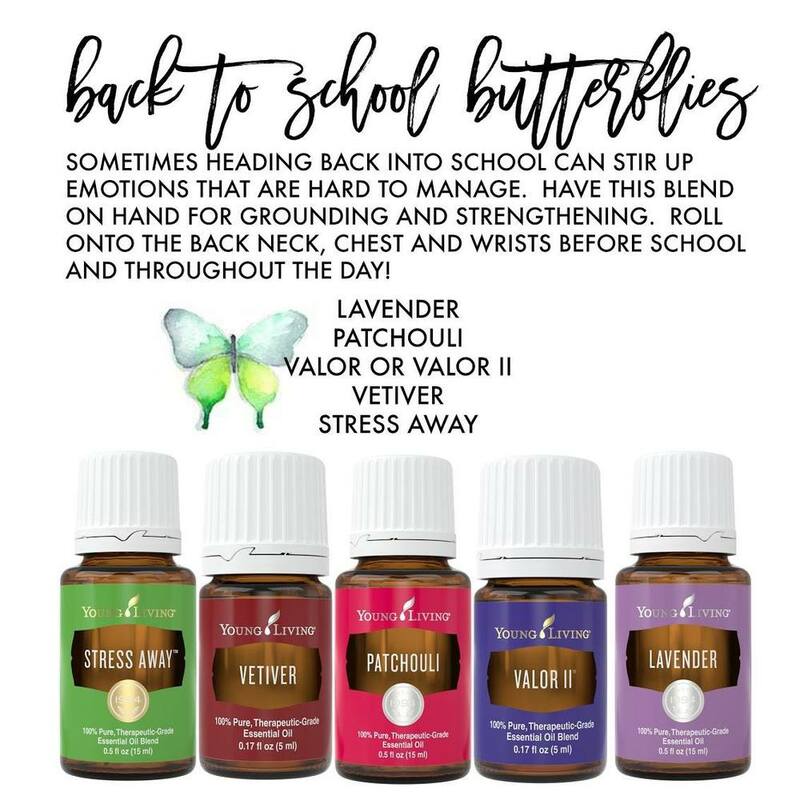 If your kiddo has a hard time gearing up for the change and newness of their school year and getting back into the swing of things, then this blend is a great one for that emotional support! +Pack in their backpack and teach them how to apply when feeling nervous. + Lavender – This oil is going to become your swiss army knife as you prepare for your child to go back to school! Known for it’s calming properties, it is safe for littles and perfect to diffuse or apply topically to promote peace during tense situations. + Patchouli – this oil has a calming, relaxing scent when used aromatically. Use this one to create peaceful feelings in your little ones! + Valor – This blend may help with feelings of empowerment and self-esteem. Perfect for nervous little ones (and you for as you send your child to school! ), this blend is sure to become a favorite. 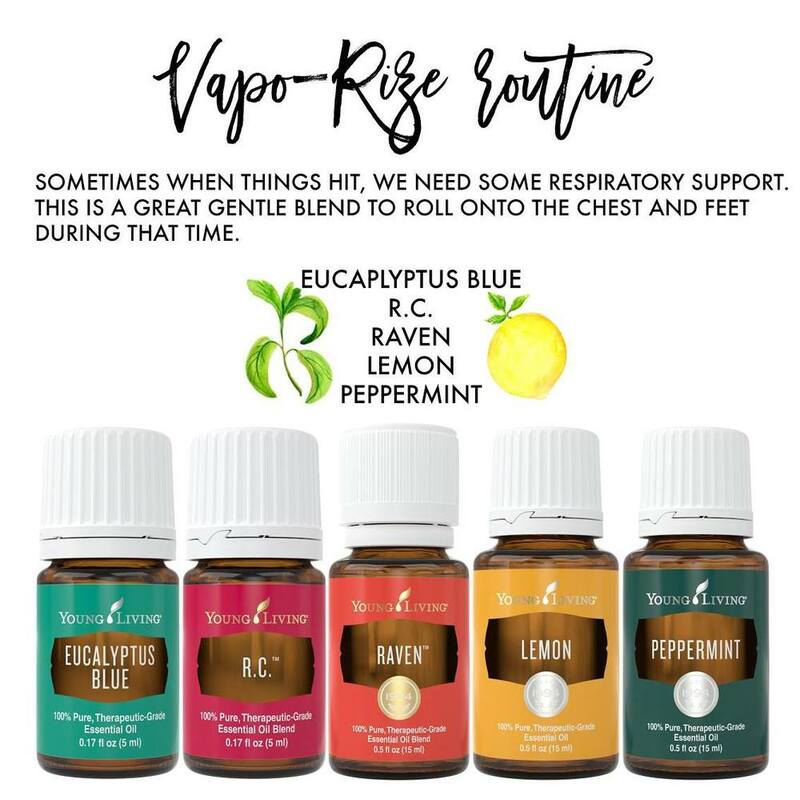 + Valor II – This blend, a replacement for Valor, contains unique properties which and inspiring and calming when diffused, and empowering when applying topically. + Stress Away – This blend helps to create a calm and relaxed atmosphere. Perfect for both child and mama during this season of life, Stress Away may help with feelings of nervousness and can be beneficial in working through stressful times. + Vetiver – this oil has a distinct earthy and grounding scent to it. Use this oil to help your child focus and stay calm during tense times! When the winter bugs hit, this is a roller to have on hand to support a healthy immune system and respiratory system! I call this Huddy’s Vapo-Rize routine! Roll onto the chest and feet as well as diffuse! +Eucalyptus Blue- Found in Ecuador and Australia and has a spicy, herbaceous smell. This Eucalyptus can be found in the Breathe Again Roller blend. The fresh aroma is calming to the mind. +RC – R.C.™ Essential Oil is a powerful blend of Spruce, Cyprus, and three types of Eucalyptus oils (E. globulus, E. radiata, and E. citriodora). Diffuse or apply it directly before, during, or after your workout. Its energetic aroma will help you stay motivated when you hit the weights, treadmill, or bike. RC Essential Oil specifically supports and soothes especially when placed on the bottom of feet or over chest*. Make a hot compress to provide more comfort in chest during the winter months. +Raven – Raven™ is a cleansing blend of Ravintsara, Peppermint, Eucalyptus Radiata, and other essential oils. Raven creates a cooling sensation when applied topically to the chest and throat. +Lemon – Lemon is used worldwide in cleaners and soaps for its refreshing scent and cleansing properties. +Peppermint – Fresh, nostalgic, and instantly recognizable, Peppermint essential oil’s scent invigorates the mind and senses, while inspiring a sense of peace. Used topically, Peppermint oil creates a cool, tingling sensation on the skin. 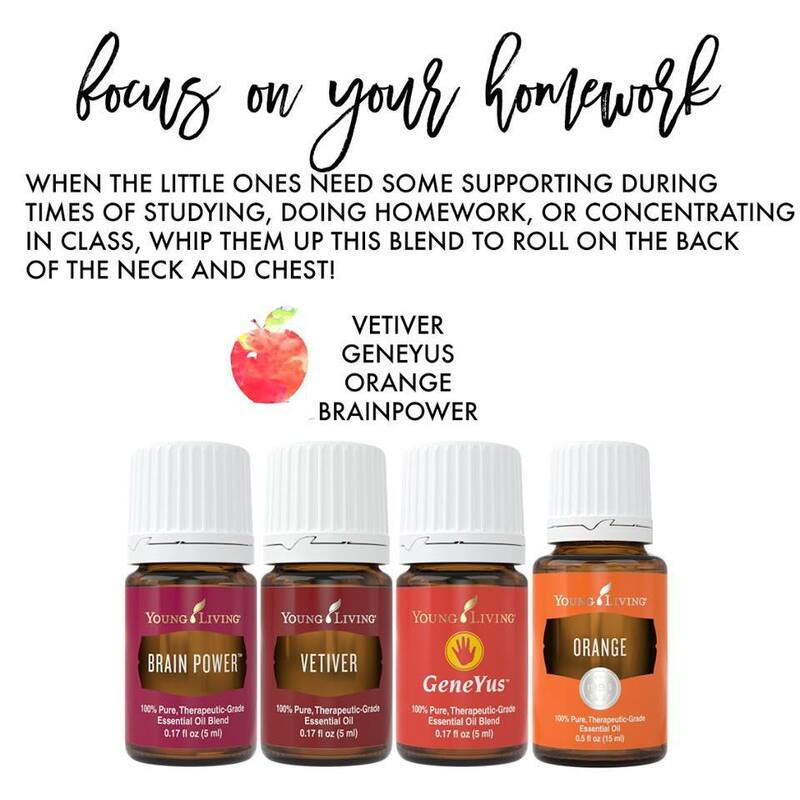 This blend is great for the kiddos who have a hard time focusing in class. It’s also one to grab when any of the kids are working on homework and needing to calm down and get things done! We use a lot of brain support oils and this has become a favorite! +Roll onto the back of the neck while working. +Pack in their backpack and teach them how to roll it on before test taking. + Brain Power – this blend contains oils such as Royal Hawaiian Sandalwood and Frankincense, which are very high in sesquiterpenes. Higher levels of sesquiterpenes enable our DNA cells to receive more oxygen, which promotes clarity and focus. This means that your child will be receiving internal support in his or her brain as they are completing their homework or while focusing in school! + Orange – the perfect oil for both uplifting and calming, it has a delightful scent that is perfect to inspire peaceful feelings in both you and your child! +GeneYus – this blend is perfectly diluted and ready to go for your child! Similar in sesquiterpenes levels to Brain Power, it is formulated to help your child focus and concentrate on their task at hand! 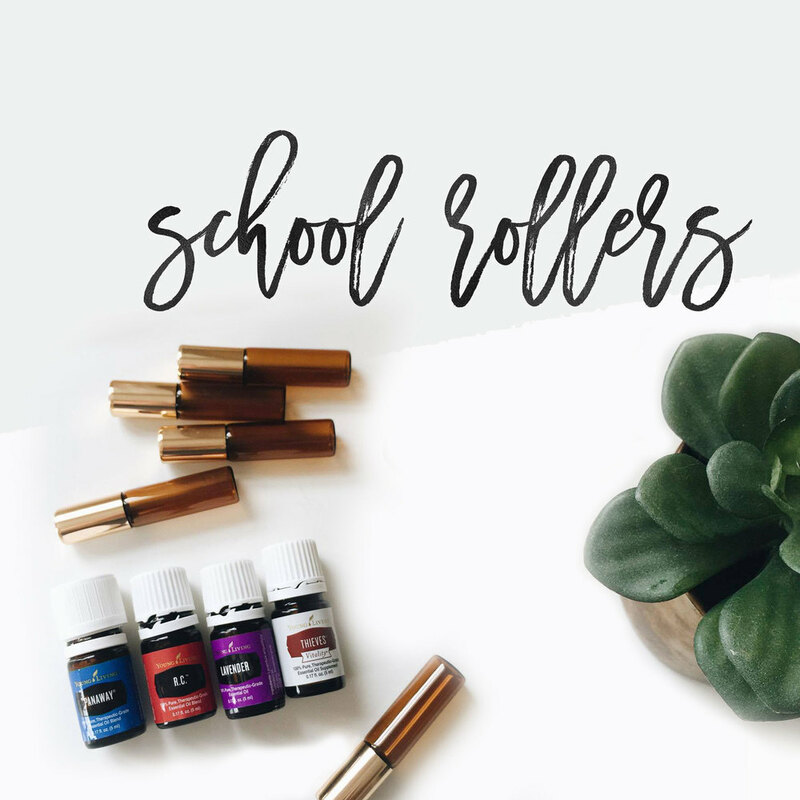 Put a roller attachment on this one and roll onto your child before the school day begins, or even put it in their backpack so that they can use it throughout the day! If your child has a nut allergy, you should not use this blend. Are you ready to start your journey with Essential Oils? ?